the journey is commitment to achieving the Black Belt. This is different from "attending martial art classes"
to achieve success in the complex world of the 21st century. respond to physical threats or surprises with integrity. perseverance in study and dependable mental habits. Next month will continue with the Hands, Head and Heart of the Black Belt ! training in the Black Belt Club. Mental ability is essential for success in the coming century. The ability to respond to problems intelligently, and with flexibility and persistence, will be the hallmark of success. By expecting both dependability and high scholastic achievement, martial arts instructors will prepare students selected for the Black Belt Club to meet these challenges. Only by instilling the values of loyalty, justice, kindness, respect and service in others do our instructors fulfill their deepest responsibilities. We develop in our students an indomitable spirit and all the virtues necessary for success in Black Belt training. Men and women who complete the program and receive the Black Belt, deserve and receive the highest respect for their accomplishment. “MOST PURE THOUGHTS DIRECTING YOUR MARTIAL ARTS COURSE, WILL NOT COME OF THE MIND, BUT OF THE HEART"
In Wado Kai the title of Sensei or teacher is given to a person who has earned the right to wear a black belt and proven that they can teach. If the dojo has more than one teacher the head instructor, if he has the rank of 5th dan, is usually called by his last name and then sensei will follow or the head teacher can be called O-sensei. Most of the time sensei is said with the black belts last name or just sensei. It is a title that has been earned and said in respect by students. What do you do if a black belt enters the dojo while students are training ? The student or teacher who is teaching at the time should bring the class to attention if the black belt entering is a higher rank. This need only to be done once during the training session, not every time the black belt comes and goes from the dojo. It is also a courtesy that the teacher bow the class to a visiting black belt who has come to share his time and respect to your dojo. Who runs a sparring session ? An instructor who is qualified to teach should always be on the floor when sparring takes place. Never take it upon yourself to start a sparring session without permission or a black belt present. Who runs a class ? Most of the time a black belt who is trained and qualified to handle groups will run the dojo workouts. If a black belt is not present at start time the senior qualified belt or sempei will start the workout. It is not disrespectful to inform the black belt of your intentions if he is busy. It is also common place that senior belts soon to be black belts must teach classes to prove they have the potential to be a sensei. Should I wear a crest on my uniform ? All black belts who train should have their dojo symbol on their uniforms. This shows pride in their style of teaching, respect to their teacher, and passes on a good example to their students that they can be proud to display their style at all times. All students should follow this example with pride and let others see where their skills come from. 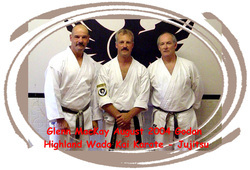 Why should I be registered with the Wado Kai ? Everyone who is to become a black belt must pay an annual fee to The Highland Wado Kai system, this registers them with the Shintani Wado Kai Karate Federation of North America. Without being registered Highland Karate cannot award a certification of black belt to any student. Should I learn other Martial Arts ? This question brings up a lot of pros and cons. The Wado Kai style of karate is very complex with its entire structure. Its system takes one a life time to learn through study and practices. To learn other styles would take great dedication to the martial arts. It is however important to relate to other styles of martial arts for the best of what can be used to improve or help a student develop and what will help their own individuality. The newsletter comes out to all students at the beginning of each month. It covers all the events for that month that students need to know, gradings, tournaments, seminars, special classes available to students, upcoming general events, karate stories and dates that the dojo will be closed. Can I go to tournaments ? Yes, all students can attend tournaments. New students should wait for the permission of their teacher to see if they are ready to attend competition at this level. There is also a competition team that students can join to get extra training for tournaments. Going to tournaments helps support your dojo, lets your teacher see how you compare with other clubs and helps make improvements with teaching style. It also allows students to set goals for improvement. Actual tournament competition will prepare a student well for when they may need to use their karate as a defense system for self preservation. Twice a week is sufficient for training. If a student wishes to train more they may do so. Staggering your training will cause slow development in improvement in the martial arts. For a student to become good and reach the level of black belt the training should be constant without long breaks. What should I be doing with karate outside of the dojo ? Karate is for defense purposes only. It is only to be used as a last effort in self protection from attack. It should not be used outside the dojo by students to impress or harm an individual. Remember that what you do reflects back to your dojo. When can I learn to use a weapon ? Usually a student will be able to train with a weapon such as the bo when they have reached the level of green belt. At this rank a student should have a clear understanding of the basics in karate and be mature enough to understand the weapon as an extension of their own empty hand techniques. When will I get graded ? Every month there is a posting for those who may attempt promotion to their next rank. There is a minimum time frame for all gradings, but gradings depend also on attendance, effort and accumulated knowledge. The instructors are the ones who will determine when it is the proper time for a student to be promoted. Remember everyone is unique and not all will advance together. It is frowned upon to always ask when your next promotion will be. Why should I learn Japanese terminology in my training ? Wado Kai has a standard in its training for traditionalism, the learning of the language and its symbolism gives us a better understanding of Japanese culture and how it relates to life. Why do I need to wear protective equipment in an controlled art. Safety equipment is mandatory at Highland Karate when sparring. Techniques are controlled but striking is allowed to certain parts of the body. The equipment provides protection if an accident should occur when striking and also prevents injury when blocking. Head gear is very important if a student falls and strikes their head. Sparring (kumite) in karate gives the student the opportunity to practice the accumulation techniques they have learned, while facing an actually opponent. Because karate in its early days was used in fighting actual armed enemies and was itself perfected into a dangerous weapon, it wasn't until it became associated with the other Japanese martial arts that the concept of focusing the techniques just short of contact with the opponent was developed, making sparring possible. Mutual trust between opponents which is said to be an important feature of the morality of Japanese martial arts is expressed in the rules of free-style sparring, where any attack which actually strikes a vital point of the opponent is forbidden. Besides giving the student practice in hand techniques , foot techniques, and body shifting, sparring also trains him in distancing (keeping the proper distance between oneself and one's opponent necessary for the execution of the technique as well as courage and composure). In basic sparring, the two participants face each other from a fixed distance and take turns attacking and defending. In every case, the mode of attack and target are predetermined. It could appropriately be called a formal exercise in sparring (kihon kumite kata). The purpose of basic sparring is to train beginners in the principles of applying techniques. As in basic sparring, in this practice technique the mode of attack and the vital point to be attacked are prearranged. However, both attacker and defender assume relaxed ready positions and move about. The attacker must find an opening and create the proper distance from his opponent before attacking. The defender must watch for the attack and be ready to defend himself. As soon as the attack comes he must block or dodge then counterattack. This type of sparring approaches the more advance free-style sparring. The student should apply dynamically the examples given in basic sparring. This is a midway step between basic and free-style sparring. It gives excellent training in distancing, finding an opening, and correct and speedy use of techniques in action. Both attacker and defender must attempt to distance properly, one for the purpose of defending. After the student has acquired a degree of proficiency in this type of sparring, a more advanced variation is to predetermine the attacker and defender, but to attack at any point and in any way desired. The next step in kumite is completely free form sparring in which neither the form of attack nor the defence are prearranged. It resembles sparring in boxing, except that the attacks are pulled just short of contact with the target. The rules of free-style sparring strictly prohibit any needless action which is liable to injure the opponent, such as stamping his instep more strongly than is necessary, or striking with great force an arm which is not attacking. Obviously, there is danger of serious injury if one of the participants actually strikes one of his opponent's vital points with a focused attack. 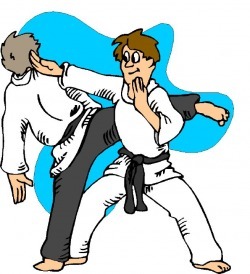 However, one of the test of proficiency in karate is the ability to focus even the strongest technique just short of contact with the target, so this danger is minimized. Because it contains elements of both competition and uncertainty and can be played in earnest, free-style sparring has steadily gained in popularity among karate enthusiasts in Japan. However, for beginners, besides being dangerous, it actually impedes them acquiring skill. Finding an opening in opponent's defense depends on training and experience and can hardly be explained here. The best way to take advantage of an opening once found or created depends on the proper application of various techniques. The belt or obi is tied in a square knot. When first tying the belt make sure that your uniform or gi ties have been tied and properly secured as in fig. 1, 2, and 3. This will prevent your uniform from coming out constantly and saving you from having to retie your belt constantly during class. Find the centre of the belt by folding it in half as in fig. 4. Place the centerpoint of your belt at the front of your waist as in fig. 5. Carry each end around the back of your body fig. 6. Then continue the ends to the front fig. 7, and tie the knot as shown, From there draw the overlapping ends of the belt up between the jacket and the belt, left end over right end and under both belt strands fig. 8. Complete the knot as shown, right end over left end under and through the hole formed by the belt fig. 9 and 10. Pull the belt tight with a quick snapping action of both ends with the hands. The belt ends should be equal after the square knot is tied and secured fig. 11 and 12. In Japanese, when you addressed someone (especially higher rank than you), formally you should always call his/her family name followed by the title regards. For example: Ishihara Kancho, Suzuki Shihan... Etc. It is very common in North America to call the title followed by the family name or last name. For example: Shihan Alan or Shihan Chan. It is fine, however, it is not original. In fact, it is more simple to just call his title regards. For example: Kancho, Shihan or Shibucho. This is very acceptable and polite. It is just more formal to address his/her title with the family name. NOTES: Hanshi, Kyoshi, Renshi are the official titles of the master level. It is not necessary to address these titles. E.g: you do not say Hayashi Kyoshi¨. The title Sensei will be discussed at a later time and in detail. The history of Yamanaka Shindo Ryu (YSR) jujutsu can be traced to Yoshitoki Shizobei Akiyama, who was the ryuso (‘school founder’) of Yoshin Ryu Jujutsu. The art progressed to Ozibe Hitosuynagi, who held a menkyo in Yoshin Ryu, and Tamizaemon Yamamoto, who founded the Shin-no-Shindo Ryu. Yamamoto was a master of the Yoshin style of Jujutsu. He lived in Osaka and held a senior position in the city police. Reportedly, he created this style of jujutsu to deal with the issue of restraining Samurai of higher rank. There were numerous societal restrictions that prohibited harming higher ranked samurai. Hence the style had a myriad of restraining techniques and also shime waza (strangulation techniques). Yamamoto awarded menkyo to Joyemon Homma who taught Sekizai Yamagi, known later in life as Mataemon Iso. Ozibe Hitosuyanagi was also a teacher of Mataemon Iso. Iso founded the Tenjin Shinyo Ryu school. In addition to studying Shin-no-Shindo Ryu and Yoshin Ryu, he studied Miura Ryu. Two descendants in this lineage were Masamichi Iso (Tanjin Shinyo Ryu) and Hirotsuke Totsuka (menkyo Yoshin Ryu). These two martial art experts taught the ryuso Shindo Yoshin Ryu Katsunosuke Matsuoka who began his school in approximately 1868. Matsuoka’s jujutsu system was heavily based on the principles of Totsuka's Yoshin Ryu. Moreover, he included other aspects from the other styles in which he was trained including some of the strategies still found today in Shindo Ryu jujutsu. Matsuoka’s system - Shindo Yoshin Ryu - translates as "new way willow spirit school". In later years the first kanji, pronounced "shin", was changed from one meaning "new" to one meaning "sacred", although still pronounced "shin." Thus, "new willow spirit school" became the "sacred willow spirit school." One of Matsuoka's students, Matakichi Inose (Nidai Soke) taught and awarded Menkyo Kaiden to Yokiyoshi Tatsusaburo Nakayama. Nakayama taught jujutsu at the Shimozuma Middle School for approximately 20 years. Nakayama was a classically trained Kenjutsu and Jujutsu instructor. 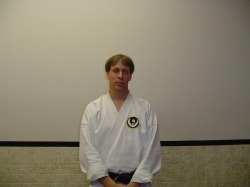 He was a student of Jikishin Kage Ryu and Onoha Itto Ryu, both kenjutsu schools. It is with these origins of the sword that influenced many of the movements in Yamanaka Shindo-Ryu Jujutsu. Nakayama's most famous student was Hironori Ohtsuka who was born on June 1st, 1892 in Shimodate City, Ibaraji, Japan. His father was Dr. Tokujiro Ohtsuka who operated a clinic. As a boy he listened to his mother's uncle, Chojiro Ebashi, tell exhilarating tales of samurai endeavours. Ebashi, too, was a respected samurai warrior. Ohtsuka began martial arts training at five practicing jujutsu under his uncle's instruction. One of Ohtsuka Sensei's premier students was Masaru Shintani (1927-2000) who originally began the Kokusai Shindo Remnei - World Shindo Federation. Shintani Sensei was born February 3, 1927 in Vancouver, British Columbia, Canada to Japanese parents who had immigrated to Canada. Shintani Sensei's mother, Tsuruye Shintani, was a daughter of a Samurai from the famous Matsumoto Clan. Shintani gained his early training in a number of Japanese martial arts including those taught to his family members within the Matsumoto. He eventually became yudansha in Judo, Aikido, and Kendo. Sensei Masaru Shintani was a direct student of Ohtsuka Sensei for many years. Shintani Sensei trained in the martial arts for approximately sixty years. Notably, prior to his death in 2000, he had attained the rank of Kudan (9th) degree black belt Wado Ryu, the highest ranking in North America, as well as being Saiko Shihan in Shindo Ryu. His early childhood training was supplemented while he was a boy in an internment camp for Canadians of Japanese descent in British Columbia during the Second World War. Here, he met Akira Kitegawa who had trained in Shuri-te style karate under Sokun Matsumura and Anko Itosu. Shintani Sensei trained with Kitagawa Sensei for many years until Kitagawa's death. On his passing, Shintani Sensei began his search to learn more about the martial arts. Throughout the 1950's Shintani Sensei studied, trained and competed in Japan. This culminated with him winning the All Japan Karate Championships where he first came to the attention of Ohtsuka Sensei. This meeting would flourish into a life long student-teacher relationship and caring friendship. Masaru Shintani Sensei was sometimes known to use different hand techniques than those practiced by other traditional Wado stylists. It must be remembered that Shintani Sensei knew the hand techniques of Shuri Te, Wado ryu, jujutsu, aikido as well as those incorporated from the techniques of his ancestors from the Matsumoto clan. He was a true modern samurai as evidenced by his mastery of several martial arts. He understood the deep jujutsu roots of his art and fully utilized techniques from jujutsu. Shintani Sensei developed a large organization with in excess of 1200 black belts. He, like Ohtsuka Sensei, went further back through his martial arts heritage and developed his own organization called the World Shindo Federation or Kokusai Shindo Renmei. In deference to his teacher's art (Shindo Yoshin Ryu), he called his art Shindo as well; however, the kanji "shin" was reverted to mean "new" once again and "do" was translated as "way". Thus the "new way" was born (again!). One of the vehicles for teaching Shindo ryu is a staff or rod similar to the Jo but is a sanshaku bo or hanbo. Shintani Sensei developed many techniques for Shindo ryu from the hanbo (3 foot staff) jutsu techniques of his samurai ancestors. Today, the hanbojutsu waza of Shindo ryu are practiced as a martial art around the world. As well, many of its techniques were refined as defensive tactics for law enforcement. Interestingly, many of the original waza of the hanbo were, in fact, kenjutsu techniques and were meant to be performed with a blade as well as being offensive in nature. In YSR jujutsu, the cognate weapons training is hanbojutsu, rather than the sword, which is often more typical in other traditional jujutsu ryu. Shintani Sensei died May 7, 2000 in Kapuskasing Ontario Canada. When Shintani Sensei was eulogized it was noted that he had a dream to teach and continue Ohtsuka Sensei's ways of harmony ("wado"). The eulogy noted that Shintani Sensei's dream would be fulfilled with the help of his Senate members, his yudansha and all the members of his organization. I have never forgotten his advice. He taught me four steps for excellence at kata. 1. Learn the moves of your katas, learn what moves to do. Watch the position of your feet and hands. Understand the directions you must turn. What stances do you have to use? 2. Understand the kata. Know what each technique is for and understand the power needed to perform the technique properly. Know where to put the dynamics and where to hesitate in your moves. 3. Perfect the kata. Look at each and every stance. Ask yourself if you are low enough. Make sure your legs are in the proper position. Check to see if your knees are correct. The position of your feet must be correct. Where do I put the emphasis of power in my strikes? Where should I put the proper speed? Do I have good facial expression to convince the people watching? 4. Go back to #1 and learn the kata over again. You should practice the kata you want to perfect at least twice a day. To win in kata, one should first choose the kata they wish to do. Usually one that is most suited for your body structure and that will help to show your strength’s through the kata. Follow the four steps as mentioned above. Once you know and understand the kata, practice, practice, practice. I know some national champions in kata who practice their form 50 times per day. That is why they are champions. They are always looking at what will appeal to the judges. opponent. You should perform the kata for the judges as if you were defeating an opponent. Show good facial expression or acting the kata. 7. Show confidence in your kata. Being uncertain will cause you to falter and you will lose points incompetition kata for this. Sensie Kelsey George has been put in the spot light for standing out over 2012 for her amazing effort and dedication with her position as a Highland Wado Kai instructor. Kelsey has taught faithfully with her delegated classes and has won over the hearts of her students in the Warriors group. She has clocked in the most hours for teaching and then volunteered her time in filling in while others were away. 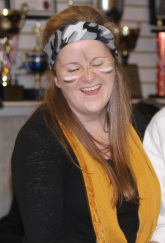 Sensei Kelsey dedicates her time to our Special Events, Community involvement, tournaments and gives her input into helping make her students training more beneficial and fun while they are there. She is a quality instructor who is starting to grow into an experienced teacher. Kelsey will be attempting her 2nd degree black belt grading in February of 2013. Everyone at Highland appreciates her efforts and teamwork the she puts into being a great instructor. All of us at Highland Karate are very proud of what Kelsey has accomplished in 2012. We know that this year she will excel once more with showing her skills as a teacher and student of the martial arts. Thanks Kelsey for being there when myself or other couldn't. karate is the ability to focus even the strongest technique just short of contact with the target, so this danger is minimized. Because it contains elements of both competition and uncertainty and can be played in earnest, free-style sparring has steadily gained in popularity among karate enthusiasts in Japan. proper application of the various techniques explained previously. The following pages contain examples of creating openings, both actively and passively. - grasping block with reverse punch. Grab and move opponents forward hand and punch. 1. The Triple - left lead leg front kick, left back fist, right reverse punch and right roundhouse kick. 2. Tornado Kick - Right outside crescent kick, left spinning back kick and right roundhouse. 4. Defense Kick - Right or left lead leg forward. Depending on attacker's stance we use a front leg hook kick or a front leg roundhouse, this technique should be practiced with a partner who changes stance position. 5. Combination - Technique can be use from either side. Right back fist with a right jumping side kick. Taller students who are using this may find the lunging side kick more efficient to cover more distance. Brown & Black Belt Questions toward Promotion !! If your in a period of training where promotion to black belt or higher is presenting it's opportunity then these are topics that you should be able to answer. Each week over the next few months I will be putting topics on this page. If you are grading sometime in the next year this would be an excellent opportunity to accumulate these topics and research the answers to those that you do not know. Most of this information can be found in our manuals that are available at the dojo or through you instructors that you train with. Breathing: EXPLAIN THE SIMILARITY BETWEEN SANCHIN BREATHING AND KIAI. STUDENT TO DEVELOP POWER AT THEIR TIME OF CONTACT. OTHER TWO OF THE TRILOGY OF KARATE, WHAT DOES KATA GIVE US AS? KATA. (LIST AS MANY POINTS AS POSSIBLE). USED BY A STUDENT AT THE SAME TIME. Philosophy: WHAT IS MUSHIN, WHERE DO WE USE THIS IN OUR MARTIAL ARTS TRAINING? GIVE AN EXAMPLE. YOU HAVE LEARNED FROM EACH PINAN KATA. PROPER PURPOSE IN THE MARTIAL ARTS. Next set of questions will be posted soon ! Philosophy: WHY IS DISCIPLINE NECESSARY IN THE STUDY OF KARATE? THAT CAN BE USED TO STRIKE AN OPPONENT WITH. YOUR LIST OF FAVORITE TECHNIQUES. The Black Belt Quest ! The path to the Black Belt is a journey to adulthood that trains a student's hands, head, and heart. The first step on the journey is commitment to achieving the Black Belt. This is different from "attending martial art classes" The formal commitment to the Black Belt Quest begins with the student's response to an invitation. Martial arts instructors select students who have demonstrated commitment, ability and determination during the entry-level program. The young man or woman who earns the Black Belt must be physically prepared, mentally alert and morally committed to achieve success in the complex world of the 21st century. The Black Belt program requires enough physical proficiency in the martial arts to give the student the confidence to respond to physical threats or surprises with integrity. Before the Black Belt is awarded, the student will also have shown perseverance in study and dependable mental habits. The Black Belt honour is awarded only to those students who consistently demonstrate an indomitable spirit in their daily lives. instructors fulfill their deepest responsibilities. We develop in our students an indomitable spirit and all the virtues necessary for success in Black Belt training. Men and women who complete the program and receive the Black Belt, deserve and receive the highest respect for their accomplishment. Breaking techniques are a part of the martial arts, they are not to be looked at as a goal to reach but must be a part of the total study of your martial arts experience. Breaking techniques will help you master your martial art. By this I mean that breaking is very difficult, requiring accuracy, speed and power. These are the essential elements for breaking. When we discuss accuracy in striking a target one must be exact, obviously your aim must go for the target and be exact. This will give the practitioner the opportunity to realize how effective your strikes are. It also makes one realize the potential they have to cause harm to a person. Breaking techniques develop confidence but must be done at full contact and power. No matter how hard you strike an object, you will not damage it if it moves with the power of your punch. If your punch or strike moves faster than the target moves away, the target will break, it has no choice. It is very important that you focus your strike exactly on the pressure point of your target. In breaking you have the opportunity and the obligation to hit the exact spot. After all you would not kick your opponent in the thigh and expect his knee to break. An important feature in breaking is that your partner must learn, how to hold a board, as you must learn , where to strike a target. If you do not hit the right spot on a target you will be very aware of it. One must practice controlled striking. This will develop your focus. An important feature to remember when breaking is that bricks or concrete have very little flexibility, wood and bones have a great deal of flexibility. The materials that have more flexibility are usually the hardest to break. Everything breaks only after it is pushed past the limit of how far it bends. You must have the power and speed to push it past that limit before it has a chance to recover. You must aim for 'penetration'. One can have weight and speed behind all their technique but without 'concentration', you will neither have focus or penetration. If your mind is elsewhere, your concentration is also, your mind will not focus in on your target. Concern yourself only with the project at hand. Good breaking techniques demand daily practice, concentrated focus, confidence and ability. You must have many martial art skills and be in good physical condition. Then you will find that power, accuracy, and speed are your best elements in the development of expert breaking techniques. An attempt at breaking can be well prepared physically, but if the student is not prepared mentally their break is an assured failure. One must use 'MUSHIN' or clear the mind of all thoughts but the break. Be of beginners mind or visualize the break, leave the presence of anything that will cause a disturbance, go to your visualized safe place. There should only be one sound and one person, the breaker. Breathing deeply while concentrating on the break gives the breaker calmness and the physical body alert for power. Visualize what you must to make the break, slowly with deep breath control 'SANCHIN' touch the target area several times building power and getting the harmony for the break. Breathing will increase to a faster rate just before the break. The breaker must not tense to soon before the break, this will cause a drop in power because the acceleration will not be there. BREAKING IS AN ACT OF VIOLENCE ! The small circle principle used in the Wado-Kai system is given the meaning open or unfinished circle "en". The circle is the essence of the strategy and movements in Wado Kai. The infinite points on a circle represent the unlimited positions we move to and counter from in meeting an opponent. The circular movement that takes one out of a line of attack and into a position for counterattack is the basis of Wado technique. represents the idea that our challenge is never finished, although we are always working towards making it so. This unfinished state reminds us that perfection is to be aimed for even if it cannot be achieved. Always be courteous to everyone. Bow before entering and leaving the dojo. Always bow in respect to a teacher after you have asked a question . Never enter the dojo with your shoes on. Always ask permission to leave the dojo floor. Never bring food or drink into the dojo. Keep your attendance up for classes and do not be late. At all times respect the health of others. Never train sick or injured it will affect others and can cause further harm to yourself. Always give your best effort at everything you do. Always adhere to the rules and regulations of the dojo and allow the instructors to enforce these rules without interference. Do your part before and after every class to keep the dojo neat and tidy. Students should never criticize another when doing something wrong but help to correct . Never embarrass another student in front of others, isolate them to talk about the problem. Show respect at all times to the instructor in charge of the dojo. Move quickly on his direction and refrain from talking when he is giving direction to everyone. Origins of the Karate Rank System Throughout the course of our karatedo training, we take for granted the grading system that awards our belt ranking and titles. Sometimes this system is manifestly personal, with the headmaster--and only he--bestowing each promotion directly, according to his own standards. Often, the testing for and awarding of rank is a more bureaucratic affair, with a committee exercising a perfunctory duty in a formally standardized and even routine mannerless ceremony, yet somehow more officious. The recent writings of Hanshi Richard Kim of the Butoku-kai (Dojo Fall 1993) taught how the dan/kyu (degree) system was adopted by modem budo systems, promulgated by the Butoku-kai, and codified in its final form for Japanese karatedo by the Federation of All Japan Karatedo Organizations (FAJKO). To truly understand this ranking system, it is important to gain a clearer insight into how the various masters obtained their ranking, since that forms the basis for your rank. This much we know for certain: On April 12, 1924, Gichin Funakoshi, the "Father of Modern Karate," awarded karate's first black belt dan upon seven men. The recipients included Hironori Ohtsuka, founder of wado-ryu karatedo, Shinken Gima, later of gima-ha shoto-ryu, and Ante Tokuda, Gima's cousin, who received a nidan (second degree) black belt. Like Gima, Tokuda had trained extensively in Okinawa before coming to Japan proper. The others were Kasuya, Akiba, Shimizu and Hirose. This beginning was a highly personal, yet formal ceremony in which Funakoshi is said to have handed out lengths of black belting to his pupils. Still there is no evidence that Funakoshi himself had ranking in any budo under the dan/kyu system. Actually, Funakoshi was greatly influenced by Jigoro Kano, aristocratic founder of judo, and originator of the dan/kyu system. Kano was a highly respected individual, and Funakoshi prided himself on being an educated and "proper" man who rightly believed that he was acting correctly. Kano's system was not only being applied to judo, but to other budo as well under the aegis of the Butoku-kai and the Japanese Ministry of Education. Funakoshi, then, just adopted the order of the day: a ranking system officially sanctioned by Japan's greatest martial arts entities. Funakoshi's own rank was of no consequence, since it seems that belt ranking was really just something for the students, not for headmasters. For its part, the Butoku-kai issued instructor's licenses: the titles renshi (the lowest), kyoshi, and hanshi (the highest). It would be a while before the dan/kyu system became universal in karate. By the end of the 1930s, each karate group was called upon to register with the butoku-kai for official sanctioning, and in 1938, a meeting of the Butoku-kai's official karatedo leaders was held in Tokyo. Its purpose was to discuss the standards for awarding rank within their art. Attending, among others, were Hironori Ohtsuka of wado-ryu, Kenwa Mabuni of shito-ryu, Kensei Kinjo (Kaneshiro) and Sannosuke Ueshima of kushin-ryu, Tatsuo Yamada of Nippon kempo, Koyu Konishi of shindo-jinen-ryu, and a young Gogen Yamaguchi of goju-ryu. Most of these men were founders of their own styles, and as such automatically became the highest rank that their agreed-on respective standards allowed. Yamaguchi assumed leadership of goju-ryu because, we are told, goju-ryu's founder, Chojun Miyagi, personally asked him to take the leadership of the style in Japan. About then, Funakoshi also finalized the grading standards for use at his shotokan dojo. Of course, the Butoku-kai continued to sanction head teachers directly. This was not without controversy, however, since Konishi sat on the board that awarded Funakoshi his renshi and Konishi had been Funakoshi's student. Of course, Konishi had inside ties to the Butoku-kai by virtue of birth, something the Okinawan Funakoshi could not have. After the ravages of war in the Pacific, the surviving karate leaders had to begin anew. With the Butoku-kai administration shut down for years to come, each karate group was on its own. The acknowledged leaders of each faction, as well as individual dojo chiefs, gave out dan ranks based upon all original sanctioning by the Butoku-kai or mandates inherited directly from the ryu's founder. Rushing in to fill the vacuum left by the Butoku-kai, various dojo coalesced to perpetuate the art and legitimize its members' ranks. In the late 1940s and early 1950s, each new association, including the Gojukai, Shito-kai, Chito-kai, Shotokai and Japan Karate associations codified their rules and issued rank accordingly. Generally, several instructors created a board of directors or council to govern the association. Some officer, be it the chief instructor, president, director or chairman would have signature authority on menjo (rank certificates). In this way, the senior-most members would attain their rank by being acknowledged and "signed off" by the board or committee. Other times, a senior member of one faction would attain high enough rank from the faction-head to then go out and form his own style or organization. Supposedly, the famous Masutatsu Oyama received his eighth dan from Goju-kai head Gogen Yamaguchi. Oyama later formed his own style that was not completely a type of goju-ryu. Usually in a legalistic and officious way these groups would simply adopt or adhere to some even higher authority or granting agency to further legitimize their actions. Recognition by the Japanese Ministry of Education was the ultimate sanction for individuals and groups in these times. Also new associations -- both in Japan proper and in Okinawa -- appeared. These became the grantor ranking authority, much in the way the Butoku-kai had acted previously. These new organizations were to set the pattern and be the original source for today's ranking. As with the single-style clubs, the head instructors often assumed the rank for which they were qualified, based on criteria they wrote themselves. One of the first was the All Japan Karatedo Federation, which seems to have started shortly after World War II as a confederation of headmasters such as Funakoshi, Chitose, Mabuni, Yamaguchi and Toyama. They regularized the dan/kyu system to some extent, and with this group the modern Japanese karate ranking system became the norm. This unity did not last however. For example, the ranking was not consistent from group to group in the upper levels. The shotokan associations such as the JKA and the Shotokai only used up to godan (fifth rank) at this time. As a result, some groups had ceased to participate by the early 1950s. Even more reminiscent of the Butoku-kai was the International Martial Arts Federation (IMAF), known as the Kokusai Budoin. Originally named the National Japan Health Association, IMAF was launched in 1952 by powerful martial artists from several disciplines. From judo there was Kyuzo Mifune, Kazuo Ito and Shizuo Sato. From kendo came Hakudo Nakayama and Hiromasa Takano, and from karatedo there was Hironori Ohtsuka. Its first chairman was Prince Tsunenori Kaya. From the start, IMAF was set up by senior martial artists to preserve and promote various budo to create a mutually supportive network. A ranking system consisting of first through tenth dan, as well as the title system of renshi, kyoshi and hanshi, was adopted. Now highly respected and skilled instructors could have a direct avenue for promotion themselves. Several karateka including Gogen Yamaguchi, Hironori Ohtsuka (I and II), and more recently, Hirokazu Kanazawa of shotokan, received their highest grades through IMAF. For Okinawa, the dan/kyu system did not really take hold until 1956, with the formation of the Okinawa Karate Association (OKF). Chosin Chibana, first to name his system shorin-ryu, was the first president. According to the historical data of the Shudokan (a Japanese group started by Kanken Toyama in Tokyo), Chibana and Toyama were officially recognized by the Japanese Ministry of Education to grant any rank in the art of karate, regardless of style. Chibana helped organize the OKF, and it was then that the mainstream Okinawan groups, on a widespread basis, began differentiating their black belt ranks as other than simple teacher and student demarcations. A talented and, some say, colorful character, Toyama gave several certifications as largess to dojo heads in Okinawa and Japan proper. These were usually shibucho ("superintendent," from the feudal area commander title) diplomas. These certifications set up the individuals so named as head of their own branch of the All Japan Karatedo Federation and, by extension, of their own groups. Eizo Shimabuku, founder of the shobayashi-ryu/shorin-ryu faction (a Kyan-type tomarite/shurite shorin-ryu blend), traces his own tenth dan to a Toyama certification. Shimabuku's assumption of the tenth dan, and his wearing of a red belt, was not without dispute, and it was controversies of this type that led most Okinawan leaders to eschew the red belt altogether. The AJKF did not last as a unified group of different styles in Japan proper. Toyama's foray back to Okinawa did lead later to the formation of the AJKF-Okinawa Branch with the organizing help of Isamu Tamotsu. Tamotsu became a student of Okinawa's Zenryo Shimabuku (of Kyan-type shorinryu) and would become known as the soke (style head) of the Japanese faction of Shorinji-ryu. In 1960, the Okinawan branch of the AJKF organized with Zenryo Shimabuku as president. A constituent group of this AJKF was the Okinawa Kempo League headed up by Shigeru Nakamura and Zenryo Shimabuku as a loose confederation of various technique sharing dojo. Like other associations, the AJKF Okinawa Branch provided for the ranking of its member instructors. It operated as a rival to the Okinawa Karate Federation. However, it did not last long either and its member schools drifted away and formed other alliances. Its emblem did not die, however. The same patch is still used by Tsuyoshi Chitose's Chito-kai. The center karate leaders continued on their own or became part of other groups, using authority inherited mostly from members of one of the original Okinawan organizations, the most significant is the All Okinawa Karate and Kobudo Rengokai. Formed by Seitoku Higa as a successor to the Okinawa Federation in 1967, the Okinawa detail of the emblem was used to distinguish each member group. Seiyu Oyata can be seen wearing this patch in Dojo, Fall 1993, page 13. Chitose was a founding member of the original Japanese AJKF, but his tenth dan was issued in 1958, according to the Chitokai, by the All Okinawa Karate Kobudo Rengokai. His hanshi title was issued by the same group in 1962. This is confusing however, since the AOKK-Rengokai was not formed until 1967. It grew out of an earlier group: the Okinawa Kobudo Federation that was organized in 1961. This later group was organized by Seitoku Higa (of various lineages related to shorin-ryu) and Seikichi Uehara (molobu-ryu). Higa had been ranked by Toyama while living in Japan and may have been connected with the original AJKF. As we learned from Richard Kim, the most significant event in the use of the dan/kyu system in karate was the formation of the FAJKO in 1964. All the major groups and factions of Japanese karatedo were brought under FAJKO's umbrella. By 1971, a ranking structure was adopted that standardized all the systems. High rank was issued to FAJKO member instructors by the organization's board. In this way, heads of constituent organizations could be upgraded, much as in earlier attempts at confederacy. An earlier, but smaller, confederacy of schools with rank-sanctioning authority was the Japan Karatedo Rengokai, which still exists and is a member of FAJKO. After the birth of FAJKO, the JKA upgraded its own ranking requirements to conform. Sixth and eighth dans were awarded in the JKA back in the mid-1960s, and Hidetaka Nishiyama in Los Angeles was one of those upgraded at that time. Though not all groups participate in FAJKO these days, most still are tied to that organization in terms of rank structure and sanction. Others, not so tied, have conformed to the FAJKO criteria and standards nonetheless. Shortly after FAJKO was launched, the Okinawans formed the All Okinawa Karatedo Federation as a successor to the old OKF. Members of both the OKF and AJKF-Okinawa Branch became part of the new association. Some of Okinawa's most mainstream karate leaders formed the AOKF board. These included Nagamine, Zenryo Shimabuku, Meitoku Yagi of gojuryu, Kanei Uechi of uechi-ryu and Yuchoku Higa of shorin-ryu. They adopted a dan/kyu and renshi, kyoshi, hanshi (plus a hanshisei) system almost identical to FAJKOs. Other karate leaders continued on their own or became part of other groups, using authority inherited mostly from members of one of the original Okinawan organizations. Probably the most significant is the All Okinawa Karate and Kobudo Rengokai. Formed by Seitku Higa as a successor to the Okinawa Kobudo Federation in 1967, the Okinawa Rengokai also adopted very similar standards to the AOKF. Higa's organizations had certified as hanshi--and hence supreme instructor--several who were style or group heads in their own right. These included Shinsuke Kaneshima of Tozan-ryu from shurite, Hohan Soken of matsumura shorin-ryu, Shinpo Matayoshi of matayoshi kobudo Kenko Nakaima of ryuel-ryu, ShianToma of shorin-ryu (Kyan type) and motobu-ryu, Tatsuo Shimabuku of isshin-ryu, Shosei Kina of uhuchiku kobudo, and Zenryo Shimabuku of shorin-ryu. It is clear that karate ranks sprang from several original sources -- a relatively modem construct on an old martial art. It was issued by individuals and institutions with set standards that were recognized by other prestigious groups and individuals. And this is the crux of the matter: For rank to be recognized, the bestower must be recognized within karate's mainstream community. It must be based in tradition, and linked to a body or sanctioned individual who is perceived as beyond reproach. The standards by which rank is achieved and given must be recognizable, and conform to already existing norms in the Okinawan/Japanese martial arts hierarchy. Anyone can print up or write a fancy certificate, but absent of any governmental or legal guidelines, it is the recognition and acceptance by existing groups and institutions that give each ranking group or individual its legitimacy. The development of the ranking system is a typically human development, with rivalries and contradictions, and our own masters received their rank in different ways. The highest-ranked of the old masters did not-could not-receive the tenth dan from their "style." They were invariably ranked by someone else and applied this grade to their own group. This is still true. As in a medieval European knighting, originally any knight could dub another, then regal institutions took over. However, it is the skill and knowledge that gains the rank, not vice versa. The quest for rank, per se, misses the point. "First know yourself, and then know others." advanced of the two and expresses advanced technique . Chonan Shodan can be performed up to Blue Belt level for competition. It is also an excellent kata for weapon development for the sai and tonfa. This kata introduces double blocking techniques, middle area kicking, backfist striking, elbow strikes, haito block, finger striking, grasping strike, shuto block, hook punch, inner blocking, foot sweeping block and combination blocking and counter attacking techniques. 3. Perform nami ashi uke with the left leg and step out into kiba dachi. Simultaneously perform juji uke fist closed and return slowly to kamae position. 4. Perform morote uchi ude uke. 5. Perform morote gedan otoshi bari ude uke. 6. Look to the left and step out into hidari kokutsu dachi and perform hidari shuto uke. 7. Without changing the foot position pivot into hidari zenkutsu dachi and perform hidari gedan otoshi bari ude uke. 8. Perform right hand set position and migi mae geri. 9. Perform migi jun zuki and hidari gyaku zuki. Pivot the body to the left 90 degrees into kiba dachi and perform a migi jodan reiken uchi. 10. Look over the left shoulder and pivot 180 degrees into hidari zenkutsu dachi and perform hidari gedan otoshi bari uke. 11. Perform a migi yoko geri, and pivot the body 90 degrees after the kick to the left. 12. Rechambering the kick with hands in the right set position step out with the right leg into kiba dachi into front facing position. hidari kagi zuki with migi zuki kamae. 14. Pivoting the body 90 degrees to the right, step in front of the right leg with the left into juji dachi and perform a migi gedan zuki. 15. Bring both arms back into a right downward forearm block set position (migi otoshi ude uke), perform a migi chudan yoko geri and a migi jodan reiken uchi. 16. Rechamber the side kick and step down into right facing kiba dachi. Perform a migi haishu uke (slowly - breathing point). 17. Pivot the body 90 degrees to the right into migi zenkutsu dachi and perform a left lower downward spear hand strike with a grasping technique (hidari gedan otoshi nukite uchi, tsukami waza). The right open hand goes to the protection position for the left side of the face back of the hand is outward (migi jodan haishu uke). 18. Drawing the body upwards from the grasping strike technique shift back into right kokutsu dachi and perform a migi jodan haito uke (slowly - breathing point). 19. Without moving the feet pivot the body 180 degrees to the left into hidari zenkutsu dachi and perform right elbow front strike to the left hand palm (migi mae empi uchi). Pivot the body quickly to the right 90 degrees into kiba dachi and perform right high back elbow strike. (migi jodan ushero empi uchi). 20. Still facing the right side position shift body into migi kokutsu dachi and perform a migi jodan shuto uke ( slowly - breathing point). 21. Draw the right hand open back toward the chest area and quickly perform a migi jodan nukite te uchi. 22. Pivot the body 90 degrees to the left into kiba dachi, front facing and perform hidari kagi zuki and migi zuki kamae. 23. Look to the left, step with the right leg in front of the left into crossover stance (migi juji dachi), stepping with the left leg perform hidari nami ashi into kiba dachi. 24. Perform migi jodan seiken zuki, hidari chudan seiken zuki, pivot body 90 degrees to the left into hidari zenkutsu dachi, perform a migi mae empi uchi to the left palm hand (hidari teisho te), still in hidari zenkutsu dachi look to the right, front facing perform a migi jodan reiken uchi. 25. Pivot the body 90 degrees to the right into front facing kiba dachi and perform a migi uchi ude uke. 26. Look to the left and perform hidari nami ashi and migi uchi soto ude uke. 27. Look to the right and perform migi nami ashi and migi uchi ude uke. 28. Front facing and in kiba dachi draw the hands back into zuki kamae and perform a zuki juji uke. 29. Draw the hands back to zuki kamae, move into shizen hontai, move into musubi dachi and perform tachei rei (yasumi). WHAT IS A SENSEI ? Sensei Chris not only teaches the martial arts but puts the martial arts into his daily life and applies it's morals and values to everything he does. Out of every 10,000 students who enter into the martial arts 'ONE' will succeed to the title of ‘SENSEI.’ Out of every ten who become a sensei only one becomes a true ‘teacher’. An old saying that I have for this is:"many dare, several attempt but only a few succeed." A sensei is said to be one who has 'kokoro chikara do', spirit strength way, 'anshin', peace of mind and 'jensei' follow the course of life. practice ends and the art begins. One who reaches this level of dedication is surely titled sensei. A true sensei is one who cares and believes in themselves and their students. Their success is not measured by just martial arts but by life. A true sensei knows and teaches how to overcome challenges. Small challenges taught well prepare their students for larger goals. A true sensei pictures rewards for themselves and their students and makes them tangible. A true sensei does not punish students, they praise them. Praise will bring out the best in students. Praise is the best reward anyone can have. The body shift in karate consist of stepping, sliding, turning and combinations of these. It is very important that when performing body shifting that you maintain strong balance at all times, shift body weight smoothly, maintain correct posture, do not raise or lower your hips more than necessary, they should move more or less in a straight line. Do not raise your feet high off the ground or drag them, in either case you will lose speed and balance. This sensei believes that in the event one must and can find no other alternative but to use their self defense mechanism, then shifting allows the practitioner the opportunity of escape rather then face a very physical confrontation from an opponent. It is obvious that the quickest distance between two points is a straight line. Introduce speed with good technique and this seems to be a very quick and efficient way of defending one's self. This system although effective can lead to a good students downfall. This is an aggressive way, in which to much physical punishment has to be taken by the defender. This seems senseless if it can be avoided by shifting. extremely in their favour. This is truly the goal in Wado-kai. stationary buts moves with the shift leaving the defender in the same stance before the shift. The main concerns here are to remain calm, timing of the shift and watching the distance of the attack . This is vital in Sabaki shifts to be effective, too soon of a shift gives the attacker the opportunity to follow and strike with his technique. person the element of surprise over straight line movement of a larger person and allows them the opportunity to escape without any physical contact. This system is not taught as the only means of self-defense but is a vital part of the Wado-kai system taught in the dojo. instructors in the Wado system in the early 70's. The others were developed by myself to open the path for students to use their own imagination and skills in shifting patterns with the techniques that they are good with. These shifts practiced with free style kumite will make one an excellent competitor. Shifting diagrams to follow soon. All of the following sabaki shifts should be practiced from back stance (kokutsu dachi) to allow the student to build the strength and speed in their defensive movement and to give them a stronger wider stance to allow foot and hand attacks simultaneously. The defender should be in a left back stance for the preparation of the attack. Shifting forward and to the left at a 45 degree angle the defender will push off with the back leg and avoid the straight line attack. The defender must bring the back leg with the shift and avoid going into a lower back stance that would make their counter attack weak. The back leg should be drawn up with the shift and put the defender in the same stance or a slightly higher back stance for an equalization of stability and mobility in the counter attack. Higher levels, green belt and up should shift from a high T-stance or higher back stance and move the forward leg diagonally and to the left to make the movement quicker. At black belt level the shift should be from a high or low kokutsu either shifting or twisting the body upward into a high shiko or kiba dachi or seishon stance to avoid the attack. The feet stay stationary and only the body moves. Attacker – left stance and will step with right leg into front stance performing a right straight punch. Defender – left stance shifting to the forward and to the left on a 45 degree angle. 1. Shifting to the left with both fist on the hips, perform a left elbow block (hidari empi uke) avoiding the attack. 2. Shifting to the left, perform a left outside to inside forearm block (hidari soto uke) avoiding the attack. 6. Shiftting to the left, perform a left outside to inside forearm block (hidari soto uke) simultaneously perform a right close or underhand punch (migi ura zuki) to middle area (chudan) to avoid attacker. 7. Shifting to the left, perform a left outside to inside forearm block (hidari soto uke) turning the soto uke block downward perform a left pressing palm block (hidari osai taisho uke) perform a right outside knife hand strike (migi soto shuto uke) to the bridge of the attacker’s nose. 8. Shifting to the left, simultaneously a right sweeping inside knife hand block (migi bari uchi shuto uke) grasping the attacker’s wrist with the knife hand sweep. also perform a left sweeping palm block (hidari bari taisho uke) to attacker’s elbow to avoid the attack. 9. Shift left performing, a right sweeping inside knife hand block (migi bari uchi shuto uke) grasping the attacker’s wrist with the knife hand sweep. also perform a left palm strike (hidari taisho uchi) to attacker’s elbow. Draw the attacker’s arm inward with the right grasping block and outward with the left palm block. Draw the left knee upward and under the attacker’s arm, stepping forward into zenkutsu dachi maintaing the two pressures on the arm take attacker to the ground to avoid the attack. 10. Shiftting to the left perform, left palm block (hidari taisho uke) and a right laterial back fist strike (migi mawhashi reiken uchi) to attacker‘s rib area to avoid the attack. Mushin - Empty the Mind ! When one first enters into karate they are asked to empty their minds of all the things they know when training in class. Outside thoughts hinder your training and prevent the learning of the martial art concepts. Thus we can say Mushin is a state of mind. In the karate dojo Mushin is practiced before and after every training session. One sits and inhales deeply in through the nose and exhales through the mouth. This practice is done in all karate exercises to help keep the karateka from getting tired. In the breathing practice before class the student sits quietly with eyes closed and concentrates only on where they are now. All thoughts of the past and future are forgotten for this present time. This practice can be done in several ways and will be taught at higher levels. Mushin is an excellent practice at getting the job at hand done without distraction. It can be used to help focus in at work, school, sports and is a great aid for helping in boredom or things that are repetitious. At the end of the training session Mushin is practiced in the same manner with the breathing and the student has to become calm and peaceful. While sitting quietly with eyes closed visualize something that will give them a cooling down of the body. Some people will concentrate on a nice cold ice cube, a relaxing swim in cool water, a refreshing cold drink, standing in a breeze of cool air, etc. This principle lets the student now come back to their thoughts but leaves with them what they have learned. (How to practice mental focus page 96). Understanding the Journey - This is a philosophy used to explain Mushin further by explaining the journey of a warrior on a pathway to uphold the honour of his master. CARING: Nobody cares what you know until they are certain you care about them. BELIEF: Every success comes about because someone believes in you. If you believe you will succeed, you will. Success is just not martial arts but life. CHALLENGE: In order to succeed you must know how to overcome challenges. Meet challenges with optimism and confidence and they will become something to enjoy. Small challenges prepare for larger goals. REWARD: Picture the rewards that you are working towards. Make rewards tangible. Remember the best reward is praise. PRAISE: There is no better reward than praise from someone who cares about you, your effort, your attempts, and your success. Giving praise to a person is like life-giving sun and water to a plant. No one can grow and succeed without praise. Don’t punish to bring out the best in students. Praise them. NAGASU: to deflect the oncoming attack. INASU: to shift the body in order to remove oneself from the line of attack. NORU: to ride and strike the opponent before their forward momentum has come to a stop. The origins of karate can be traced back as far as the Greek Olympic games of 776 B.C. An event called the Pankraton, which was a mixture of wrestling and boxing, usually resulted in the winner being alive at the end of the match. Alexander the Great’s conquest of India led to this type of contest influencing Buddhist Missionaries who saw the potential of unarmed combat as a way of protecting themselves on their travels without the use of forbidden weapons. As Buddhism spread into China, other sects grasped the essence of the 'Empty Hand' and modified it according to creed and temperament. Karate spread through China, across the Ryu Kyu Islands and finally to the chain's main land-mass, Okinawa. Wado - Ryu origins can actually be traced to a Chinese Monk, Chin Genpin, who is reputed to have introduced Kempo (fist art) into Japan in the 17th century. Later the Shindo Yoshin-Ryu system set the basis for the Wado-Ryu style. It is unique amongst the other ju-jitsu systems as it stresses the art of Atemi or striking the vital and vulnerable parts of the body rather than the traditional jutsu of throwing or locking the limbs. The originator of this style, Master Yoshitoki Akiyama, developed the underlying principal after visiting China to study medicine. While he was there he started training in a form of Atemi. On his return to Japan he continued his practice of Atemi but feeling a Spiritual emptiness embarked upon a period of intense meditation in his search for enlightenment. At the end of a period of 100 days of rigorous meditation he happened to gaze upon a willow tree. It was snowing at this time and Akiyama was struck by how the branches of the tree would bend as the weight of the snow built up on them and how the snow would slide off once the bough was loaded with enough weight. Had the tree not yielded to the weight of the snow the branches would surely have snapped. This seemingly mundane observation enthused Akiyama and he used it as the basis for a new theory of Karate. There were other Sensei's who developed the theory as time went on until Master Hinori Ohtsuka formulated the Wado-Ryu techniques; but the underlying system remains the same - a basic philosophy of non-confrontation, either physically or mentally. Karate did not come to mainland Japan until 1912 when the Okinawan Master, Ginchin Funakoshi, traveled there. Hinori Ohtsuka the founder of Wado-Ryu was an accomplished Ju-jitsu Master who had received his license to teach from Tatsusaburo Nakayama (the head of the Shindo Yoshin Ryu style). Hinori Ohtsuka made the pilgrimage to train with Master Funakoshi in the new art of the Tode (Karate) which Funakoshi had brought from Okinawa. Ohtsuka was so adept and quick to learn that Funakoshi could not believe that Ohtsuka had not trained in Karate before. He so impressed Master Funakoshi that he seconded him in many demonstrations in Japan to promote the new art. It was in 1935 that the Budo Arts, Japan's National Governing Body for the martial arts, recognized the style Wado - Ryu and the way of Peace style was born.